Bu araştırmanın amacı; diyaloğa dayalı ve geleneksel birlikte okumanın 48-60 aylık çocukların dil gelişimine olan etkisini incelemektir. Çalışmaya Uşak il merkezinde Milli Eğitim Bakanlığına bağlı bağımsız anaokullarına devam eden 48-60 aylık 104 çocuk katılmıştır. Çocukların dil gelişimlerini ölçmek amacıyla “Marmara Dil Gelişim Ölçeği” ve “Peabody Resim-Kelime Testi” kullanılmıştır. Bulgular; deney grubu çocuklarının ön ve son test puanları arasında istatistiksel olarak anlamlı fark olduğunu göstermiştir. Ayrıca diyaloğa dayalı okumanın uygulandığı deney grubu çocukları ile geleneksel birlikte okumanın uygulandığı kontrol grubu çocukların dil puanları arasında istatistiksel olarak anlamlı fark olduğunu saptanmıştır. The aim of this study is to examine the effects of dialogic and shared book reading on the children’s language development. One-hundred-four children ages from 48 to 60 month-old attending to the public independent preschools in Uşak participated in this research. Data was collected through “Peabody Picture Vocabulary Test” and “Marmara Language Development Scale” before and after 10 week intervention. The research findings showed that there is a statistically significant difference between the pre and posttests scores of the children at the experimental group. Additionally, the same significant differences were found between the experimental and control groups language scores. language development, dialogic reading, traditional reading, 48-60 months-old children. Akoğlu, G., Ergül, C., ve Duman, Y. (2014). Etkileşimli kitap okuma: Korunmaya muhtaç çocukların alıcı ve ifade edici dil becerilerine etkileri. İlköğretim Online, 13(2), 622-639. Anderson, J., Anderson, A., & Shapiro, J. (1999–2002). The emergence and mediation of multiple literacies in young children from diverse backgrounds (410-99-0200). Social Sciences and Humanities Research Council of Canada. Aram, D., Fine, Y., & Ziv, M. (2013). Enhancing parent–child shared book reading interactions: Promoting references to the book's plot and socio-cognitive themes. Early Childhood Research Quarterly, 28(1), 111-122. Bay, N., ve Alisinanoğlu, F. (2012). Soru sorma becerisi öğretiminin okul öncesi öğretmenlerinin sorularinin yapisi üzerindeki etkisi. Kuramsal Eğitim Bilim Dergisi, 6(1), 1-39. Berk, L.E. (2013). Bebekler ve çocuklar: Doğum öncesinden orta çocukluğa (Çev. N. Işıkoğlu Erdoğan). Ankara: Nobel. Berthelsen, D., Fielding-Barnsley, R., Sim, S. S., Nicholson, J. M. and Walker, S. (2013). A shared reading intervention with parents to enhance young children's early literacy skills. Early Child Development and Care, (ahead-of-print), 1-19. Blewitt, P., Rump, K. M., Shealy, S. E., & Cook, S. A. (2009). Shared book reading: When and how questions affect young children's word learning. Journal of Educational Psychology, 101(2), 294. Brock, A. & Rankin, C. (2008). Communication, language and literacy from birth to five. London: Sage. Büyüköztürk, S., Kiliç Çakmak, E., Akgün, O. E., Karadeniz, S., & Demirel, F. (2009). Bilimsel araştirma yöntemleri. Ankara: Pegem Akademi. Chow, B. W. Y., McBride-Chang, C., Cheung, H., & Chow, C. S. L. (2008). Dialogic reading and morphology training in Chinese children: effects on language and literacy. Developmental Psychology, 44(1), 233. Dickinson, D. K., & McCabe, A. (2001). Bringing it all together: The multiple origins, skills, and environmental supports of early literacy. Learning Disabilities Research and Practice, 16(4), 186-202. Elmonayer, R.A. (2013). Promoting phonological awareness skills of Egyptian kindergarteners through dialogic reading. Early Child Development and Care, 2013 Vol. 183, No. 9, 1229–1241. Gonzalez, J. E., Pollard-Durodola, S., Simmons, D. C., Taylor, A. B., Davis, M. J., Fogarty, M., & Simmons, L. (2014). Enhancing preschool children's vocabulary: Effects of teacher talk before, during and after shared reading. Early Childhood Research Quarterly, 29(2), 214-226. Gönen, M., Ünüvar, P., Bıçakçı, M., Koçyiğit, S., Yazıcı, Z., Orçan, M., Aslan, D., Güven, G., ve Özyürek, A. (2010). Okul öncesi eğitim öğretmenlerinin dil etkinliklerini uygulama biçimlerinin incelenmesi. Mehmet Akif Ersoy Üniversitesi Eğitim Fakültesi Dergisi,10 (19), 23-40. Karrass, J., & Braungart-Rieker, J. M. (2005). Effects of shared parent–infant book reading on early language acquisition. Journal of Applied Developmental Psychology, 26(2), 133-148. Kotaman, H. (2008). Impacts of dialogical storybook reading on young children’s reading attitudes and vocabulary development. Reading Improvement, 45(2), 55–61. Lonigan, C. J., Purpura, D. J., Wilson, S. B., Walker, P. M., & Clancy-Menchetti, J. (2013). Evaluating the components of an emergent literacy intervention for preschool children at risk for reading difficulties. Journal of Experimental Child Psychology, 114(1), 111-130. Maul, C. A., & Ambler, K. L. (2014). Embedding Language Therapy in Dialogic Reading to Teach Morphologic Structures to Children With Language Disorders. Communication Disorders Quarterly, 1525740114525657. Oktay, A., ve Bilgin-Aydın, H. (2002). Marmara gelişim ölçeğinin geliştirilmesi (3-6 yaş dönemi çocukları için). Erken Çocukluk Gelişimi ve Eğitimi Sempozyumu Bildiriler Kitabı (pp. 64-69), Kök Yayıncılık, Ankara. Opel, A., Ameer, S. S., & Aboud, F. E. (2009). The effect of preschool dialogic reading on vocabulary among rural Bangladeshi children. International Journal of Educational Research, 48(1), 12-20. Öner, N. (2008). Türkiye'de Kullanılan Psikolojik Testler Bir Başvuru Kaynağı (İkinci Basım). İstanbul: Boğaziçi Yayınları. Pillinger, C., & Wood, C. (2014). Pilot study evaluating the impact of dialogic reading and shared reading at transition to primary school: early literacy skills and parental attitudes. Literacy, 48(3), 155-163. Ping, M.T. (2014). Group interactions in dialogic book reading activities a language learning context in preschool. Learning, Culture and Social Interaction, 3, 1146-158. Reese, E., Leyva, D., Sparks, A., & Grolnick, W. (2010). Maternal elaborative reminiscing increases low-income children's narrative skills relative to dialogic reading. Early Education and Development, 21(3), 318-342. Sim, S., Berthelsen, D. (2014). Shared book reading by parents with young children: evidence-based practice. Australasian Journal of Early Childhood, 39 (1). Sutton, M. M.,Sofka, A. E., Bojczyk, K. E., and Curenton, S. M. (2007). Assessing the quality of storybook reading. (edt. Khara L. Pence). Assessment in Emergent Literacy, CA: Plural Publishing. Trivette, C. M., & Dunst, C. J. (2007). Relative effectiveness of dialogic, interactive, and shared reading interventions. CELL Reviews: Center for Early Literacy Learning, 1(2), 1-12. Tanju, E. H.(2010). Çocuklarda kitap okuma alışkanlığına genel bir bakış. Aile ve Toplum, 3, 30-39.558. Walsh, B. A., & Blewitt, P. (2006). The effect of questioning style during storybook reading on novel vocabulary acquisition of preschoolers. Early childhood education journal, 33(4), 273-278. Wasik, B. A., & Bond, M. A. (2001). Beyond the pages of a book: Interactive book reading and language development in preschool classrooms. Journal of Educational Psychology, 93(2), 243. Whitehurst, G. J., Arnold, D. S., Epstein, J. N., Angell, A. L., Smith, M., &Fischel, J. E. (1994). A Picture book reading intervention in day care and home for children from low – income families. Developmental Psychology, 30, 679–689. Wasik, B. A., Bond, M. A., & Hindman, A. (2006). The effects of a language and literacy intervention on Head Start children and teachers. Journal of Educational Psychology, 98(1), 63. Zevenbergen, A. A. & Whitehurst, G. J. (2003). Dialogic reading: A shared book reading intervention for preschoolers. On reading books to children: Parents and teachers. (eds) Anne van Kleeck, Steven A. Stahl, & Eurydice B. Bauer London: Lawrance Erlbaum. Zevenbergen, A. A., Whitehurst, G.J.,& Zevenbergen, J.A. (2003). Effects of a shared-reading intervention on the inclusion of evaluative devices in narratives of children from low-income families. Applied Developmental Psychology, 24, 1–15. ISNAD TETİK, Gamzegül , IŞIKOĞLU ERDOĞAN, Nesrin . "Diyaloğa Dayalı Okumanın 48-60 Aylık Çocukların Dil Gelişimine Etkisi". 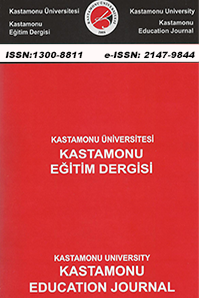 Kastamonu Eğitim Dergisi 25 / 2 (March 2017): 535-550.